Stamped concrete is a stylish and versatile material that really brings out the best in your home and outdoor areas. It’s a real investment that can add plenty of value to your home. However, stamped concrete does need a bit of cleaning and maintenance to keep it looking good as new long into the future. Every three years it is a good idea to reseal your stamped concrete, particularly if you use it regularly. This is important to remove excess dirt, keep the colours looking bright and to protect your surface against water damage and wear from daily use. If your stamped concrete is starting to look faded or blotchy, or if you can see tiny spots of white, it could be time to give it some attention. 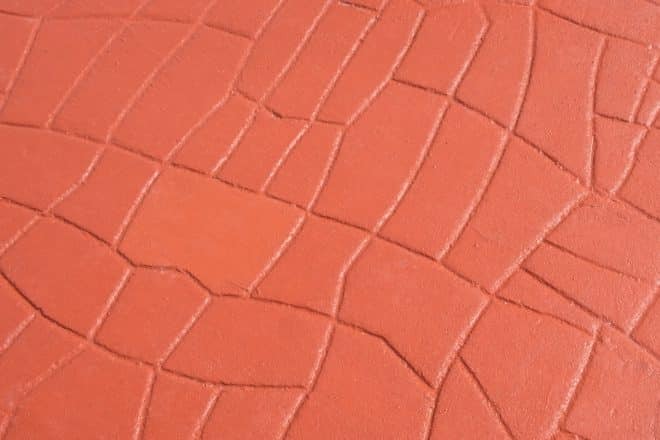 Thankfully resealing stamped concrete is an easy process and one that you can do at home – but you must ensure you follow the correct steps to reseal it otherwise you can damage it further. Here are our expert tips to reseal your stamped concrete for a great finish, every time. The first step is to give your stamped concrete a deep clean. A pressure washer should be used with a cone tip for best results. Make sure you keep the tip of the washer around 35cm from the surface to avoid leaving marks from the water. Use a 3,000psi or higher pressure washer for the job. This is enough to remove all of the dirt and debris from the surface, without harming the original sealer. If the sealed concrete needs a scrub, use a broom with stiff bristles along with a dish detergent in a bucket. Rinse it all off with water when you’re done. Once again, go easy – don’t flake off the sealer! Once you have completed the pressure washer step and have given the sealed concrete a solid clean, it’s critical to let it dry before going further. Wait at least 24 or 48 hours for the surface to dry out and dehydrate, ready for the sealer. If you’re not sure that the surface has dried, leave it another 24 hours. You don’t want to take a chance. To give your stamped concrete the best care possible, it’s important to choose a high-quality sealant that can handle the job. We recommend a clear sealant with added silane or siloxane. This will help your concrete to release moisture and fight dampness. If you have a patio or surface that sees daily use, add in a slipping agent like Shark Grip to your mixture. This is best mixed with a one-jar-to-18 litres ratio, so check the instructions and don’t use too much. Next, you need to apply your concrete sealer to the stamped concrete directly. This is where many home owners go wrong when applying their own sealer. Before getting started, it’s important to read the labels and make sure you’re mixing everything correctly and have the right tools at hand for a smooth operation. The best approach is to apply a first coat and go very thin with the solution. Use a roller brush or squeegee with an extended arm for the job, and make sure you apply evenly across all areas. Do your best to cover all areas using the least amount possible. When this coat is finished, wait about 20 – 30 minutes for it to dry. When dry, apply a second coat with the same process. Keep it thin like the first coat and make sure everything is covered this time. After you’ve put the final touches on, it’s a good idea to avoid using the surface for at least 48 hours. After that, you’re done! When you apply new sealer, what you are really doing is mixing the old sealer with the new one (because there will always be old sealer left over). It’s a good idea to use an old broom and ‘agitate’ the new sealed area just after applying your sealant to blend it together. To discover if your stamped concrete is already sealed, look at it on an angle. If the area has some sheen, it’s sealed properly. To test it simply pour a few drops of water on. If the water beads up, the sealant is fine. The best time to seal your stamped concrete is on cool, mild days. Late in the afternoon or early evening is ideal. Don’t perform the sealing in direct sunlight, in heat, or around rain or wind. Otherwise, you could end up needing to re-do the job later. If you follow these steps you will have a perfectly sealed stamped concrete surface to enjoy for years to come. For more sealed concrete tips or for help with your next project, contact Everlast today.